The Crop Circle phenomena continues to fascinate and awaken all tuned in, with it's awe inspiring beauty laid out perfectly in the fields with undeniable evidence of cellular changes in the laid down crop and the presence of a strong electromagnetic field around freshly formed crop circles just to mention some of the hard known facts gathered over the years by many prominent researchers of the mysterious transdimensional phenomena we have come to know as "Crop Circles". Steve Mitchell is a musician, mathematician, writer and lectures on mysteries and ancient traditions. His new TV Show, Mitchell’s Wyrd World and his previous works such as, Dragons and Rings, have brought him critical acclaim. Mitchell also appears in the new hit movie – The Ancient Code. What On Earth : International Crop Circles ! These Crop Cicles has some meaning. How do I analyze some takes the form of Codes Arcturians. Certainly some of these codes has everything to do with symbols of positivity. In my belief, there is a strong significance on these cycles with Crop Codes Arcurianos. But here is my question: But who put these Crop Cicles these plantations? It would be some form of intelligence of other dimensions? This blog is insane ! Truth will set us free ! 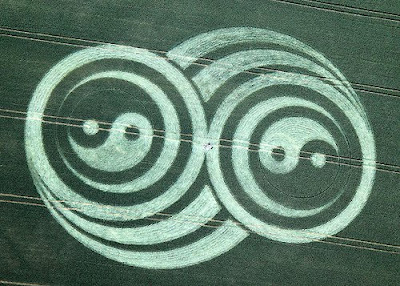 we are making the crop circles, they are a reflection of our own consciousness.